Once again hats feature in our Sepia Saturday theme image, but this week let's take our hats off and see what else there is in the picture. Well there is a telescope and there is a mountain and there are three great composers (yes Mike Brubaker, your Christmas and Birthday have come all at once!). The picture, which was taken around 1900, shows Julius Röntgen, Frants Beyer & Edvard Grieg on Mount Løvstakken in Norway. If all that music and that weighty telescope is not enough for you, you might want to note that as well as composing music, Frants Beyer was also a tax inspector and therefore you might want to scan your grandad's tax returns and submit them to the Sepia Exchequer. However you decide to interpret this fine old photograph (which comes from the collection of Bergan Public Library on Flickr Commons), just post your post on or around Saturday 1 March 2014, link it to the list below and take a look to see what else you can see on the Sepia Saturday Blog. Sepia Saturday 218 - 8 March 2014 : Fences, backyards and Bubonic Plague are amongst the possible themes from this prompt (With thanks to Wendy Mathias). 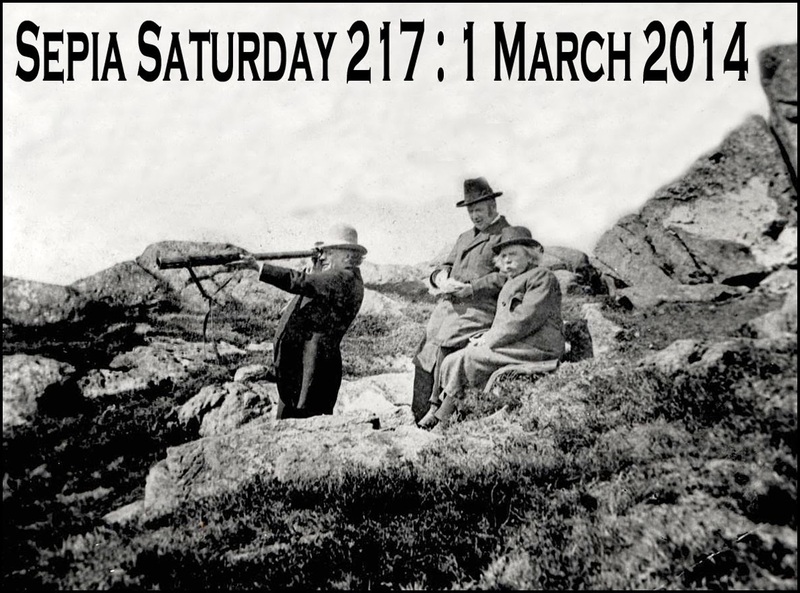 So, to the haunting refrains of the Peer Gynt Suite, get out your sepia telescopes and see what you might have to offer for Sepia Saturday 217. Ever since photography was knee high to a grasshopper, the suit has been the be-all and end-all of masculine fashion. 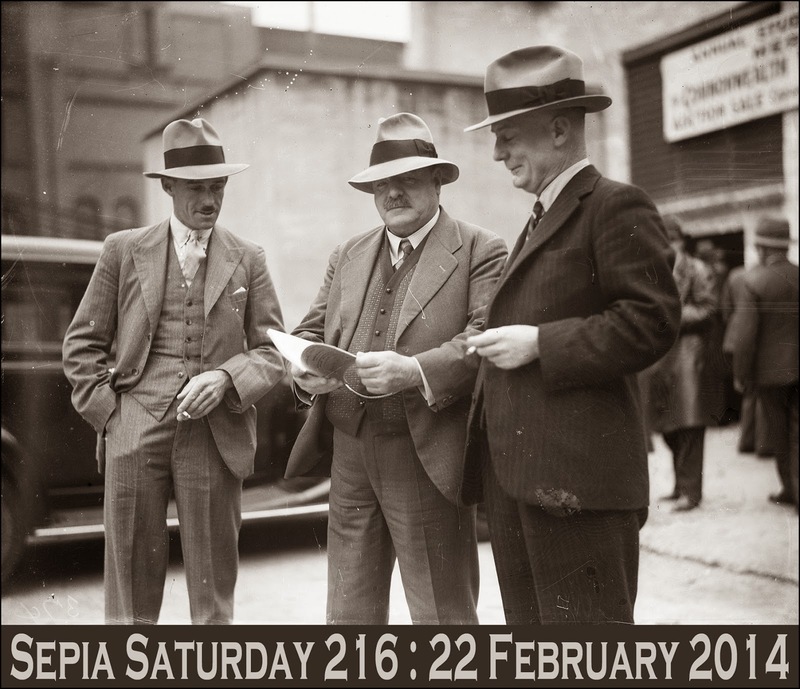 And our theme image for Sepia Saturday 216 (post your posts on or around Saturday 22 February) celebrates the suit : or rather three suits, or rather three three-piece suits. And for good measure there are three wonderful hats as well (why is it that the drab suit has stood the test of time whilst the far more practical and visually expressive hat has not?). If you don't like suits and hats you can always focus on the group of three. Or you can hunt out any other potential prompt within this picture by that old Sepia Saturday favourite Sam Hood (1872-1953) which features in the Australian National Maritime Museum collection on Flickr Commons. Regular Sepians will know what to do : post your post and then link to the list below. 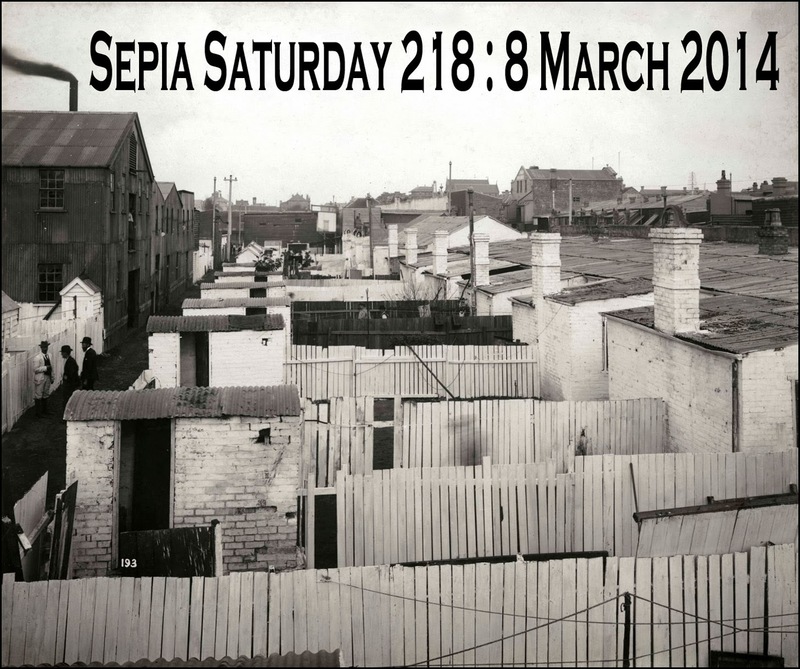 Before you put on your hat and get ready to go, have a look at what is coming up on Sepia Saturday over the coming weeks. Sepia Saturday 217 - 1 March 2014 : Hopefully we have not had this before : three men hiking up a mountain with a big telescope, one of them being a famous composer. Our theme image this week features a picture postcard view of Jamaica Street, Glasgow (from the National Gallery of Scotland stream on Flickr Commons). I am not expecting people to match the Glasgow theme, or indeed the Jamaica theme, although knowing the resources and imagination of Sepians, I wouldn't be too surprised if some people took up such a challenge. The thing that came to my mind when I first saw the image was the crowds : we always tend to think of crowded streets as being something new, something twenty-first century, but clearly that isn't the case. As always, you can go in whichever direction you want to, simply post a post on or around Saturday 15 February and link to the list below. But before you run off to catch a horse tram, take a look at our crowded agenda for the weeks to come. There we go. It's time to join the crowds and get your Sepia Saturday posts ready. Welcome one and all to Sepia Saturday 214. Before I get to the main theme, let me start with a catchy little overture. Regular Sepians can ignore this as they will have heard it all before. Sepia Saturday is an anarchic place with no rules but one or two customs and conventions. We are a group of bloggers who enjoy old photographs. We don't define what old is, and over the years we have shared photos from the mid-nineteenth century and photos from the mid nineteen-nineties : and all points in-between. We normally like to add a few words of explanation or description but the precise balance between images and words is entirely up to individual bloggers. Each week we have a theme, but the theme is open to any amount of interpretation, or it can be totally ignored and replaced with any old photo you may want to share. Once you have posted your post on your blog you add a link to the weekly Linky List and that will encourage other Sepians to visit your blog and comment on your post. We would encourage you to also visit the blogs of other Sepians and comment on their posts but we realise that it is not always possible to get around to everyone. That is the end of the overture (which hopefully new Sepians found useful) so we can now move onto the main movement. 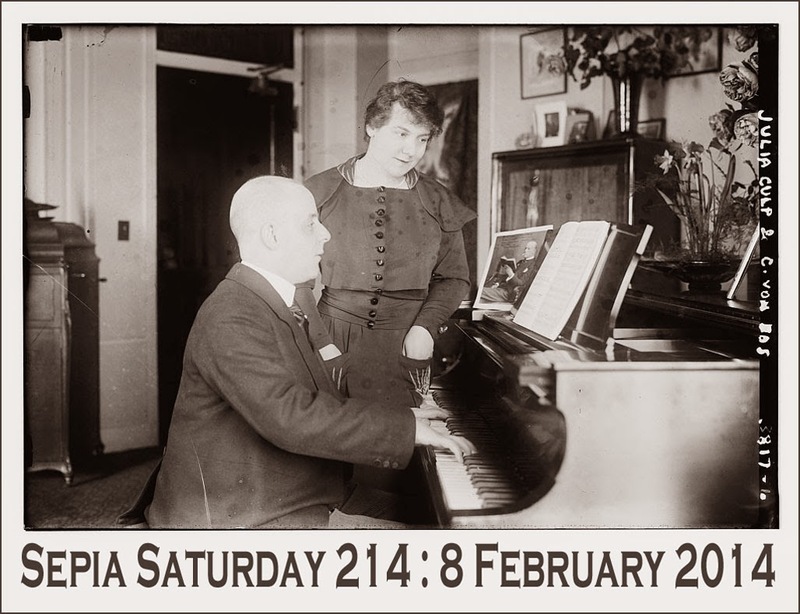 And our theme image this week features a concentrating pianist, and an enthusiastic observer. 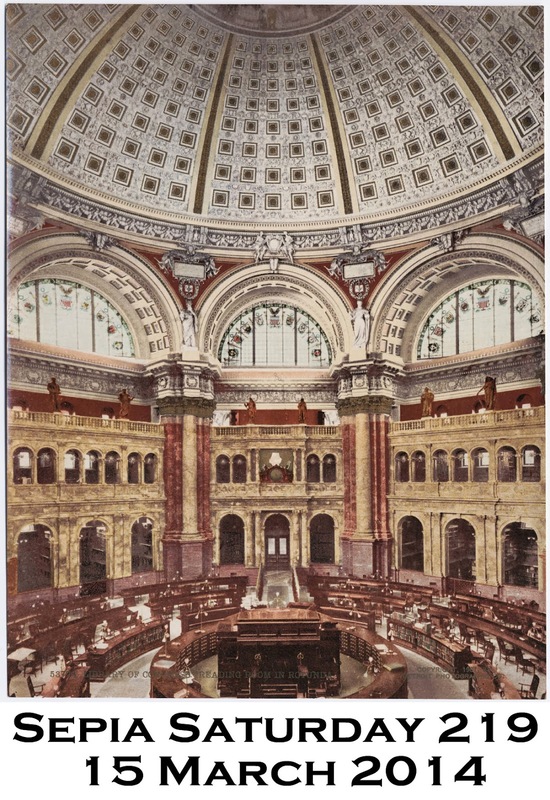 The photograph comes from the Library of Congress collection on Flickr Commons and shows Julia Culp and C Von Dos. But you don't have to go with the obvious : as with most old pictures there are a multitude of potential themes there (I rather like the picture within a picture possibility). 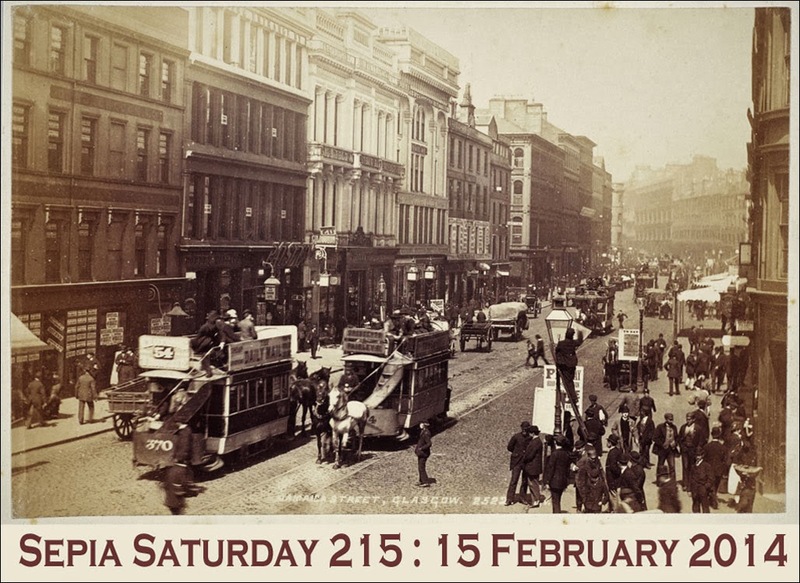 All you need to do is to decide which old photograph(s) you are going to feature and then post your post on or around Saturday 8th February 2014. Then add a link to the list below and let the sepia music begin. But back to the present performance. Ladies and Gentlemen, it gives me great pleasure to introduce our performers for this evening, playing the Sepia Saturday theme it is Julia Culp and C Von Dos.